I'm baaaa-aaaack! And with a new recipe! Hello Blogger World!!! I have made a return! My life has been moving pretty quickly for the past few months, and I haven't had a chance to post. Which really upsets me, because I love this blog, so I hope I didn't lose too many of you with the lack of blog excitement ;-) . However, things have slowed down a bit and I have made my return! Thank you all for sticking around so long and waiting it out until I posted another recipe. I don't have a picture of this recipe, but I included one that I found online that looks just like they should*. I make these all the time for dinner because they are so simple and so delicious. I always buy those aluminum throw-away pans and bake them in there, then clean up is a zip, too. (Unless you're like my mom and wash those things, which I do not because they are disposableeee) So anyway, these enchiladas can really be made any mix-matched way. I generally use red enchilada sauce with beef, and salsa verde for chicken. You can make your own chicken, but I always grab the oven-roasted whole chicken that's already finished and pick it myself. Anyway, let's get started! First, you'll want to brown your ground beef. Depending on the fat content, I swirl the pan with some olive oil first. When the meat is finished, I add the corn and black bean salsa. (Mind you, this "salsa" should be the fresh chopped salsa, not the kind in a jar.) There's really no measurement on this, it's all about what you like. Add spices of your choice (but be sure to include cumin, that's where all the flavor is) and about 4 ounces of the red enchilada sauce and incorporate. Set aside and let cool so it's easy to handle later. Repeat this exact process with the chicken (even though the chicken is already cooked, I like to incorporate everything in the pan). Instead of using the red sauce, use about a quarter jar of the salsa verde. Take a flour tortilla and spread out some shredded cheese. Top with a few large spoonfuls of the beef mixture, and roll up! Repeat seven more times and line them all up in your pan. Top with the remaining red enchilada sauce and a few heaping handfuls of shredded cheese. With your remaining eight tortillas, do the same process with the chicken. Top with the salsa verde, shredded cheddar, and put both pans in a 400-degree preheated oven until the cheese is melty and gooey! So, like I said, these can be mixed and matched in any way. One time I used an array of chopped vegetables with mozzarella cheese instead. Oh! I just thought, maybe next time I'll use scrambled eggs, diced ham, some scallions, maybe some fresh tomatoes and have breakfast enchiladas! 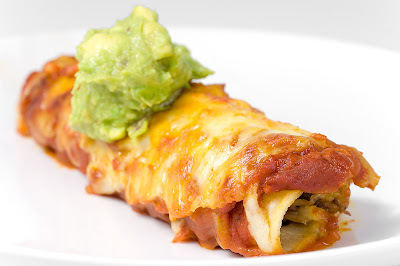 Let me know about some of your great enchilada ideas! :-) Enjoy! *Picture compliments of the blog: "Life's Ambrosia"